Pata tim is a popular Filipino-Chinese dish. 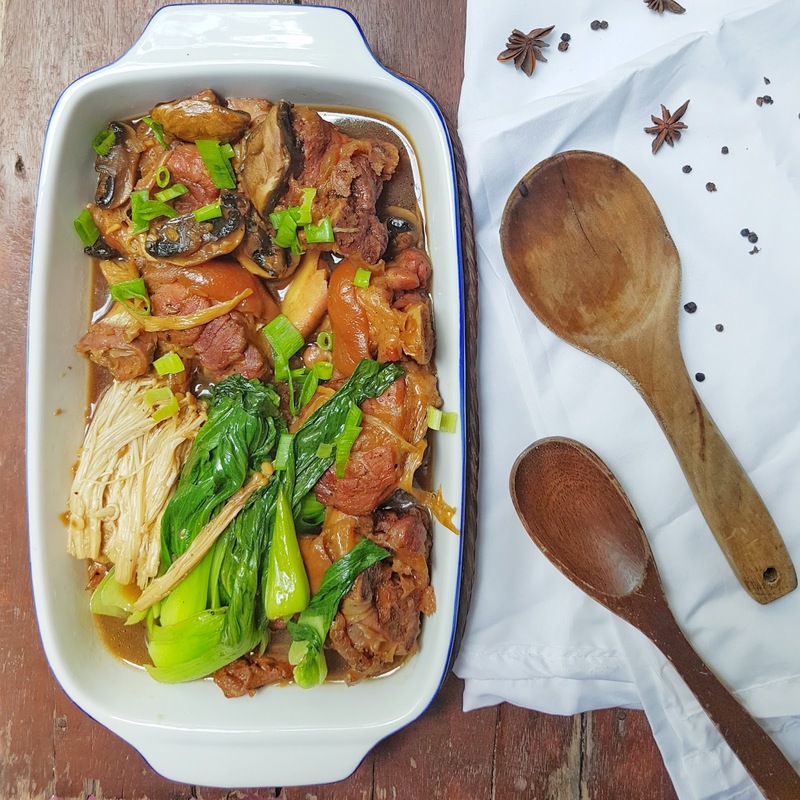 The pork hock is braised slowly in soy sauce, garlic, onion, rice wine, star anise and brown sugar to balance the savoriness of the dish. It’s a typical Asian dish, sweet and savory. Pata tim also includes vegetables like baby bok choy, mushroom and in the Philippines, we add dried banana blossom. We never had pata tim in our menu and this is the first time we cooked it at home. I searched for a pata tim recipe and come up with my own recipe. I also made additional process for a more flavorful dish. Combine pork hock, garlic, onion, black pepper, light and dark soy sauce. Marinate overnight. Preheat oven to the maximum temperature. Bake the pork hock for 30 minutes. Remember to take out the pork an hour prior to baking. Combine baked pork, rice wash, bouillon cube, whole and ground pepper. Boil and simmer for one hour. At this point, add more water if necessary. Add the chopped garlic and onion and simmer for another 30 minutes. Soak the portobello mushroom in water for an hour. Strain the water to remove impurities. This water contains lots of flavor from the mushroom. You can add this instead of refilling plain water. Add light soy sauce, rice wine, mirin, brown sugar, star anise, sesame oil and portobello mushroom. Simmer for another 30 minutes or just reduce the sauce until thick. Add baby bok choy and enoki mushroom and simmer for another 3 minutes. Garnish with onion leaks. Pata Tim is best served with lots of rice.